There are things to get done, clients to meet, tasks to complete, people to call, and emails to respond to. You have so much to do to run your business, let alone grow it. Your thought process for not taking breaks is rational. However, you DO have the time to take breaks and not only do you have the time, you NEED to take breaks to be more productive. Don’t feel like you have the time to take breaks. Eat at your desk regularly. Try to get something done every spare moment you get. Lose focus and initiate distractions such as Facebook, checking email, and chatting with colleagues to amuse yourself. Who has time for a break? Productivity is about getting the right things done and you need to be able to concentrate on those activities as well as have the endurance to complete them. 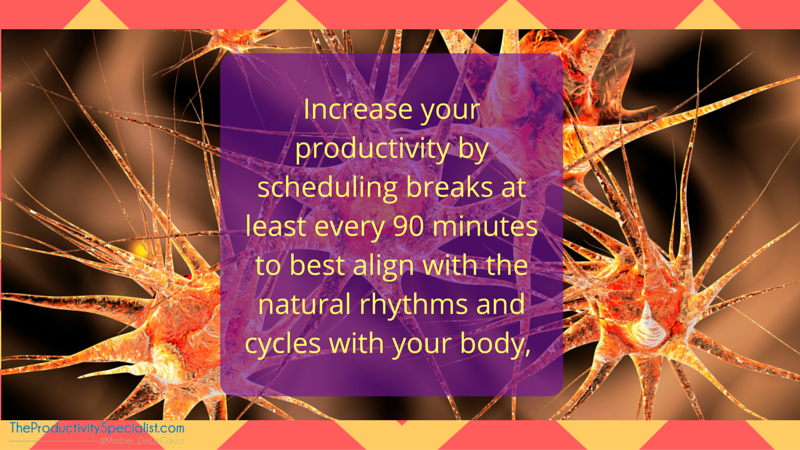 Breaks reenergize you and enable focus which leads to increased productivity. You may have already created the bad habit of not taking breaks and that’s okay but it’s time for a change. Break that bad habit and create healthy new ones in its place. Your schedule needs some buffer room in between appointments. If you are consistently booking your appointments back-to-back-to-back with little to no buffer room, you are setting yourself up for failure. Meetings often run late, unexpected phone calls ring, and employees request your attention. Plan for unexpected demands of your time by adding buffer room to your schedule. Otherwise, you will find yourself working through all of your potential breaks. It is very helpful to actually block out breaks into your schedule. Set a timer if needed so you don’t forget. Even block out your lunch so you can visually see the time that it will take for your meal. With lunch scheduled, you will have an easier time scheduling tasks around that necessary break and a better chance of actually eating. Plan out what you are going to eat ahead of time so you are not tempted to keep working through mealtimes. Everyone’s natural tendency to go toward the path of least resistance applies. Breaking for lunch, thinking about what to eat, and making or going to get food may seem like too much of a hassle for many people. If you find that to often be the case for you, make the effort to prepare and pack your lunch the night before. Doing so enables you to eat an already prepared lunch at your desk or on the road with little hassle during your workday, thus giving your body the energy and fuel it needs. You can even go one step further and prep your meals for the entire week in one day which will save you even more time and hassle. The Pomodoro Technique for taking breaks involves completing 20 minutes of work followed by a five-minute break. After completing the 25-minute cycle four times, you then take a longer 15 to 30-minute break. The Pomodoro Technique is a favorite of many but another method may work better for you. Take advantage of the many apps and online programs available to keep track of your work / break cycles so you can establish the routine of breaking effectively. The science behind your Ultradian Rhythyms says the human brain can only focus for 90 minutes before it needs a break. Therefore, it is recommended to schedule breaks at least every 90 minutes to best align with the natural rhythms and cycles in your body. Practice Traditional Corporate Breaks at a bare minimum. Such breaks typically involve a 15-minute break mid-morning, a 30 to 60-minute lunch, and a 15-minute break mid-day. When you are working on a project with an upcoming deadline or are just feeling the pressures of your daily hustle, you may not think you have time to take a break. The truth is your mind and body require breaks to work efficiently. Working through your day without taking breaks only harms your productivity. It may seem logical to equate working longer with accomplishing more but research proves that is not the case. Each time your body says gimme a break, give in to the urge. Refuel, relax, reenergize, then return to your work refocused so you can work on your important tasks with utmost efficiency.